Pilates classes in english for all nationalities! As well as offering massage, fitness, pregnancy and yoga classes, we ALSO specialize in mat and reformer pilates classes in english. We are happy to say that we will offer you quality instruction from internationally trained teachers with no sign up fees or fixed term contracts!!!! Pilates in english for people travlling to barcelona on holiday or for short periods. At simplybe pilates we understand that you could be travelling to barcelona and dont want to sign up to a studio or gym paying joining fees or having to complete a 3-12 month term wit the studio. Thats why at simplybepilates we are offering you both Yoga and Pilates classes in english with no sign up fee and not perminant contract! We also offer flexible memberships – you can chose to sign up for a month or simply buy a pack of 5 or 10 classes. Pilates in english for people who have just arrived in barcelona and are still coming to terms with Spanish. Have you just moved to Barcelona and want to get fit? 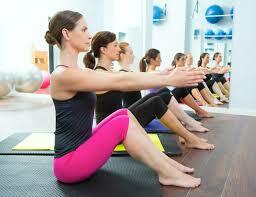 Well at simplybe we offer yoga, fitness and pilates classes in english 6 days a week! We aim to creat a fun environment where you can meet new like minded spanish, catalan and international memebers while getting a great workout. We are a friendly group and going for dinner or drink often can be suggested at the end of a class. We teach all our classes including our pilates classes in english in our beautiful centrally located studio and in summer time we also offer our classes in the city park or on the beach. A liberating experience and ideal way to enjoy barcelonas outdoor spaces. For more information about our studio or park fitness, yoga or pilates classes in english contact devorah on 644316850 and we will find the right class to book you into. If you prefer sending us an email click here.